Bocce set includes 8 balls. 4 gold balls with 2 different striping patterns, 4 silver balls with 2 different striping patterns, green bag, a wooden jack and a basic measuring device. Petanque set includes 6 silver balls with 2 different striping patterns, green bag, a wooden jack and a basic measuring device. 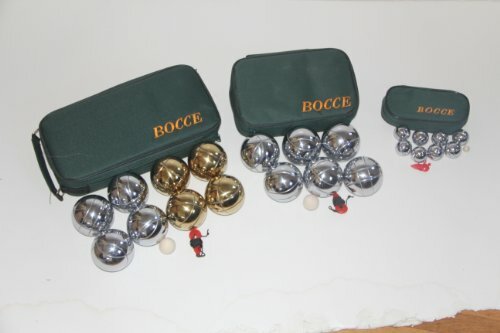 Mini Bocce set set includes 8 silver balls, 33mm, with 2 different striping patterns, green bag, a wooden jack and a basic measuring device.